Another crazy Tokyoflash design with innovative time reading system. 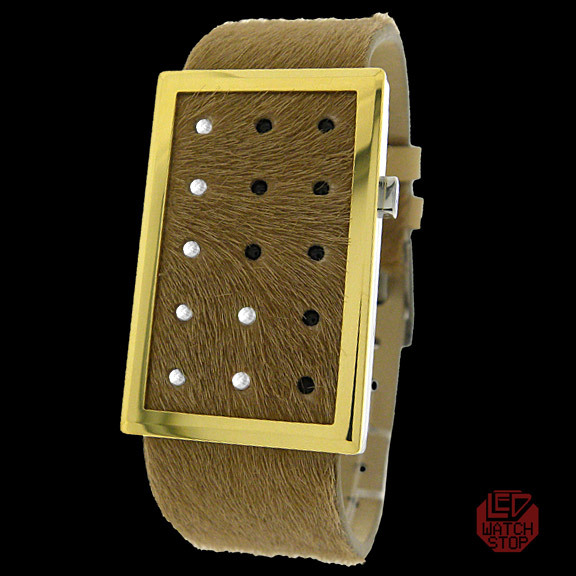 This watch features brown leather face with fur and with white LEDs. Waku has a self-adjustable fur covered strap that is suitable for all wrist sizes. The slim stainless steel case is complimented by a polished gold frame; finished by a comfortable belt style strap with secure three pin buckle. Touch Waku's button and a simple animation sparkles before the time is presented in three easy-to-read steps. Hours are shown first, one LED indicates each hour 1-12. 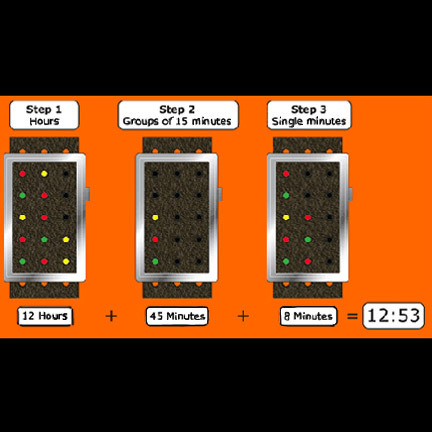 Groups of 15 minutes are next, three LEDs indicate 15, 30 and 45 minutes past the hour. Finally single minutes are presented, fourteen LEDs indicating minutes 1-14. Count the LEDs in columns of 5 and reading Waku becomes really easy!